The undersink reverse osmosis tank stores water then pushes it out of the faucet upon demand. What pushes the water out is air. For the tank to deliver water, you have to keep air in it. If air pressure in the tank gets low, only part of the water will come out of the tank. Like auto tires, RO tanks lose air over time. When the air pressure in the tank gets really low, no water at all will come out of the faucet. An airless tank is easy to recognize: You open the faucet to fill your teapot and what comes out is about half a cupful of water, then nothing but a tiny stream or a drip. If the tank needs air–and this is the most common cause of low water output–here’s how you fix it. 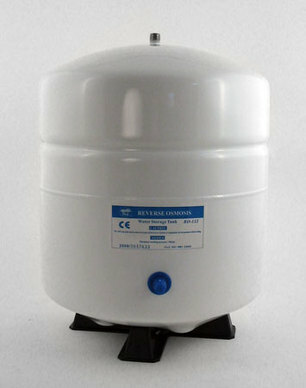 With this tank, the air valve is covered by the blue cap below the label. The tools you’ll need are two: A standard bicycle pump and a low pressure air gauge. The gauge isn’t essential, but it will help you do the job right. The gauge needs to read accurately at pressure levels under 10 psi. The gauge you use on your automobile tires is not accurate enough at low pressures. To start, turn off the inlet valve to the unit. Then, open the RO unit’s faucet and leave it open during the entire procedure. Let all the water run out of the tank. When no water is coming out of the faucet, pick up the storage tank. If it is empty, very light, the faucet isn’t the issue. 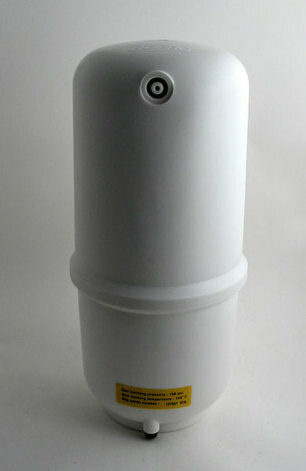 With this tank, the air valve is covered by a plastic cap at the very bottom. You may have to use a “valve stem extender” to air this tank. Auto parts stores have them. With the faucet still open, pump air slowly into the tank. Water will start to leave the tank through the open ledge faucet. Continue to pump air into the tank slowly and steadily until all water is out of it. When the tank is empty and no more water is coming out of the tank, you’re finished except for adjusting the air pressure in the tank. Try to leave about 7 pounds of pressure in the empty tank. It doesn’t have to be exact, but resist the impulse to leave lots of pressure. If you leave over 10 psi or so in the tank, you don’t gain pressure, you just lose water capacity. After you’ve aired the tank, close the faucet, open the inlet valve, and let the RO unit begin filling the tank. Since the tank is empty, it will take a couple of hours to get a full tank of water, but you can get a glassful in ten minutes. It’s OK to start using the tank at any time. For more information about reverse osmosis maintenance, go to Pure Water Products website.